A coordinate geometry is a branch of geometry where the position of the points on the plane is defined with the help of an ordered pair of numbers also known as coordinates.What are Coordinates? Now, to help you understand the coordinates, take a look at the figure below. Now, consider the grid on the right. 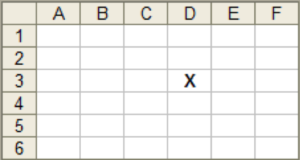 The columns of the grid are labeled as A, B, C, D, E, F, etc. On the other hand, the rows are numbered as 1, 2, 3, 4, 5, 6, and so on. You can see that the letter X is located in the box D3 i.e. column D and row 3. Here, D and 3 are the coordinates of this box. The box has two parts – one is the row and the other is the column. You need to understand that there are several boxes in every row and several boxes in every column. So, when you have both of them, you can find one single box that is the point where the rows and the columns intersect each other.